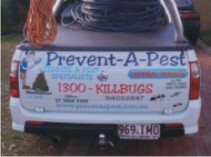 Vehicle Signage - Advertising on the run!!! Promote your business or organization wherever you go with permanent signage or choose when you want to advertise by using vehicle magnets. Both methods have their advantages and disadvantages but whichever type of advertising you choose your business will be promoted in vivid full colour to give the professional look you are seeking. By using a UV laminate on all outdoor signage we ensure you will get the longest life possible for your signs and the best value for your advertising dollar. Because of the complexities of vehicle signage we use only the best quality vinyl designed to cope with the complex curves and bumps of vehicles. 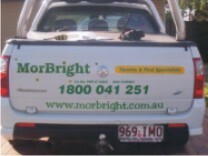 We use a mix of printed and cut vinyl signage on most vehicles and with modern techniques the cost of sign writing your vehicle is within reach of most businesses. If you decide that you would prefer to use contour cut vinyl on your vehicle, with the use of different colours and text styles you are still able to have signage that will make an impact and attract attention.